The downside: it'll set you back at least $399. There's something more than a little magical about seeing the world in front of you being devastated by dragons or augmented with arrows pointing you to your next meeting. Alas, while mixing realities like that with our smartphones is already possible, the tech still is a long way off from reaching its potential — just look at early, disappointing efforts like Lenovo's enormous Tango phone. Luckily, startups are chasing the mixed reality dream too, including one — Occipital — that has a solid track record of solving the tricky problems that pop up when blurring boundaries between worlds. 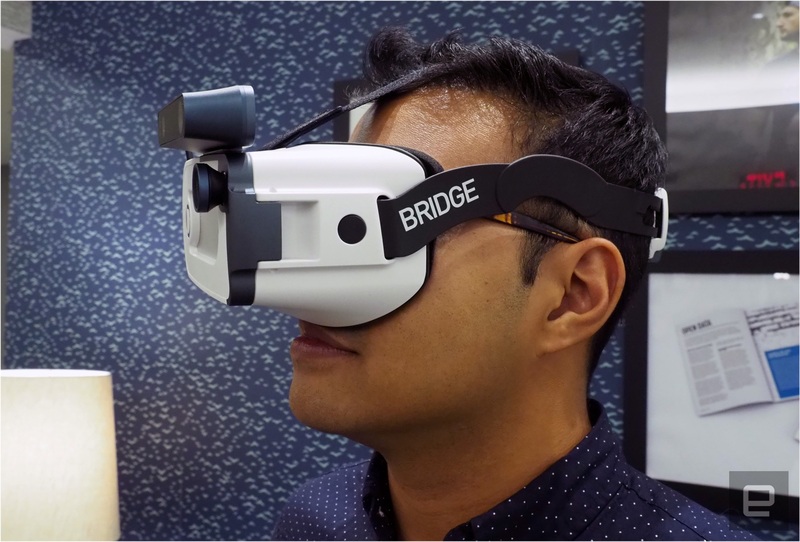 That's why the team's new mixed reality, the Bridge, seems so impressive right out of the gate. Oh, and another thing: it's specifically for iPhones. For years now, most mobile virtual reality fun has been confined to Android, with cheap Gear VRs and Daydream Views making it easy to see what all the hype was about. While some VR games and apps exist for iPhones, Apple hardware historically hasn't gotten the same kind of developer love as Android has. To Occipital, that smelled like an opportunity. The Bridge will go one sale to the masses for $399 starting in March, but developers and the adventurous can snag their Explorer Editions as soon as next week. To understand what you'll actually get for your money, we'll have to rewind a bit. 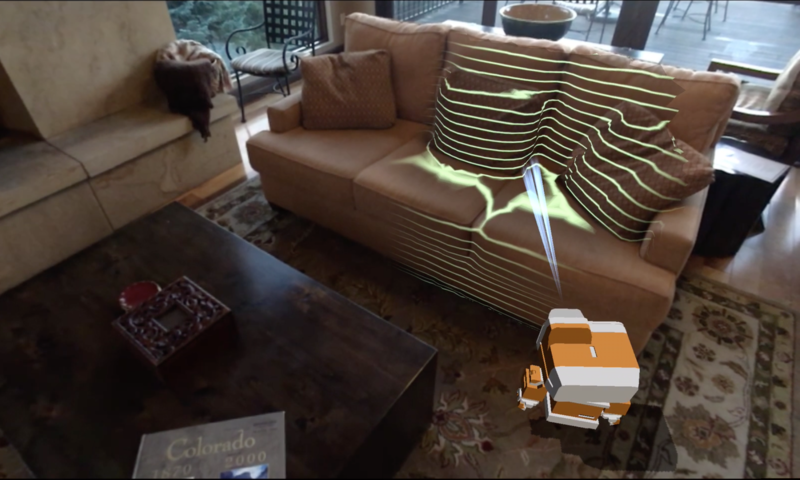 Three years ago, the company released the Structure sensor, a fascinating bit of depth-sensing tech that was originally meant to bring augmented reality experiences to the iPad. Mixed reality still seemed like a hard sell back then, but there no denying the sensor's ability to measure the world around it was the real deal. To hear Occipital marketing chief Adam Rodnitzky tell it, the sensor eventually started being used by real estate agents, interior decorators and doctors, and after three years, the Structure was still excellent at its job. So, with headsets being hawked alongside smartphones all over the place, Occipital decided to make their own — they took a Structure sensor, slapped a five-element wide-angle lens in front of it, and built a sturdy, balanced frame around it. Turning an existing product like the Structure into headset might seem like opportunism at its finest, but the end result has so much potential it almost doesn't matter. I played with one of the Explorer Editions recently, and it was more impressive — and elaborate — than I expected. You can pop an iPhone 6 (or newer, but no SEs) into the frame and a magnetically latched door keeps it in place. From there, you place the Bridge on your head as you would a crown, and use a dial in the back to tighten it. Yes, it sounds like a sort of torture device, but the system actually works like a charm. The only real problem I came across was that the lenses sit closer to your eyes than in most other mobile VR headsets — that meant they pushed right up against my glasses most of the time. It could've been worse, but Rodnitzky assured me future models wouldn't smash my frames so noticeably. Actually using Bridge was a much smoother experience. Occipital doesn't have any launch titles planned for the Bridge's debut, but it does come with a demo app that stars at adorable robot pet of sorts named Bridget. With the help of a Wiimote-like Bluetooth controller, I spent a good ten minutes tossing a virtual ball around the office and watching Bridget loop around coffee tables to retrieve it. Her understanding of the world around her was fueled by a depth-scanning session that only lasted a few seconds — once that was done, I had a mapped out a corner of our office with a level of precision that Lenovo's Phab 2 Pro wasn't able to match. That might not be the fairest comparison to make, though: for now, the Structure sensor's software is only tuned to capture spaces of about 10 ft. by 10 ft., while Tango software usually tries to record whole swaths of a room at once. Structure's scope might be more limited, but it does a much better job within those constraints. After dropping that ball one time too many, Bridget was tired and needed to charge. The answer? To grab her power cord and connect it to something that lit up, like a lamp. This is what I so sorely missed when I played with Tango — I wanted to badly for someone standing next to a virtual dinosaur to be able to interact with it or to pluck a virtual domino off the ground. This was a pretty basic example, but the sort of object recognition the Structure can pull off was unexpectedly good for a headset. Don't think the Bridge is only capable of the usual augmented reality tricks, either: at one point, I was directed to drop a portal on the ground in front of me. Once I stepped into it, I found myself walking around inside a space station with a planet hanging lazily in the dark outside a hatch. A red mesh enveloped real-world obstacles, allowing me to dodge coffee tables and loungers as I (all too briefly) explored the station. After a few more moments of stumbling, that was that — demo over. I was just a little crushed. 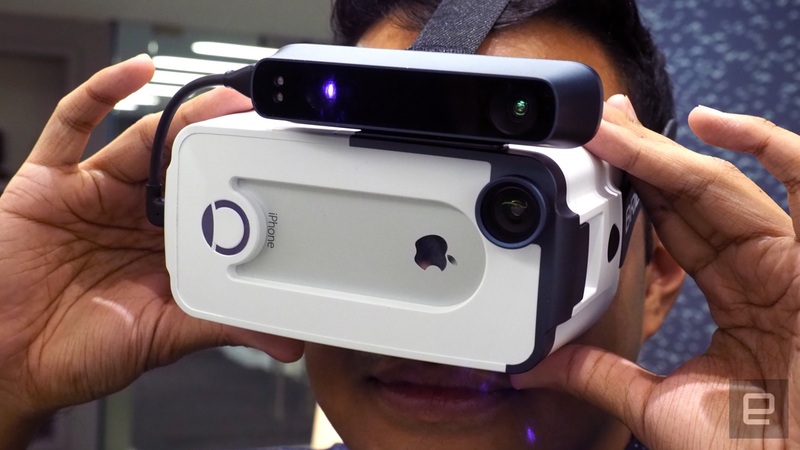 With any luck, Occipital gets the sort of support from developers it's been gunning for. The Bridge system isn't perfect for a whole host of reasons, like the iPhone's non-AMOLED display and the potentially big hit on the phone's battery, but even the unfinished demo software was almost enough to make me toss the Phab 2 Pro in a desk drawer. The right kind of love could turn the Bridge into a must-have down the road — for now, I'll just have to wait and hope.